Steven Mann made it worth the wait. In the main event of Saturday's Shamrock Fighting Championships: Fury held at the Lumiere Casino Theater, Mann made his Missouri debut in the main event against fellow welterweight Danny Andrews. Mann showcased an array of skills before finally securing a rear naked choke to earn the submission victory in the first round and improve to 7-1. For video interviews with Mann and several of the winners from Saturday, be sure to check back on Monday. Mann, a kickboxing instructor for Finney's MMA since 2012, came out of the gate strong, landing a quick head kick. Andrews, out of Poplar Bluff, eventually got the fight to the ground and worked an armbar that Mann successfully defended. Mann eventually got side control and landed some nice elbows from there, but the always-tough Andrews transitioned well and even took Mann's back from a brief moment. But Mann's athleticism prevailed as he scrambled free, worked his top game and eventually secured a body triangle. From there, he worked his way to Andrews' back and locked in the choke. Texas-product Rakim Cleveland earned a TKO victory over Ryan Sutton in a battle of light heavyweights. Sutton, a proficient grappler, secured an early takedown in the first round and worked to side control and eventually got the mount. Sutton was unsuccessful with an armbar attempt as Cleveland worked his way free. Cleveland ended the round with a half-hearted triangle attempt. Cleveland did the bulk of his damage in round two. From Sutton's half-guard, Cleveland landed some big elbows before referee Mike England finally called a halt to the fight at 4:14. In a match-up of two brawny light heavyweights who were making their pro debut, Brian Schell was able to get the submission victory over Marc Godeker. Schell opened the fight with a stiff jab that opened a cut on Godeker. Schell pressed Godeker up against the cage and worked in some knees. 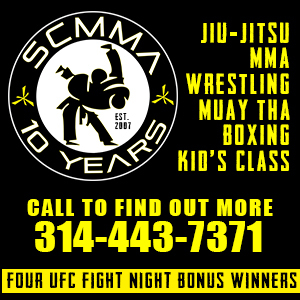 Schell, a talented jiu-jitsu practitioner was then effective from mount and eventually took his back late in the first. In the second round, Schell continued to soften Godeker up and worked well from the top position. He eventually wore down the bloody Godeker to secure the rear naked choke for the win. Also on the main event, Joe Freeman got the victory when his opponent, Jake Almeter, got sick prior to fight time and couldn't make it to the cage. On the amateur undercard, Aaron Highfill's wrestling skills were able to get the better of Scott Futrell's striking as Highfill earned a decision victory. Futrell did land some significant damage with his hands, but the grinding style of Highfill proved tough to overcome. 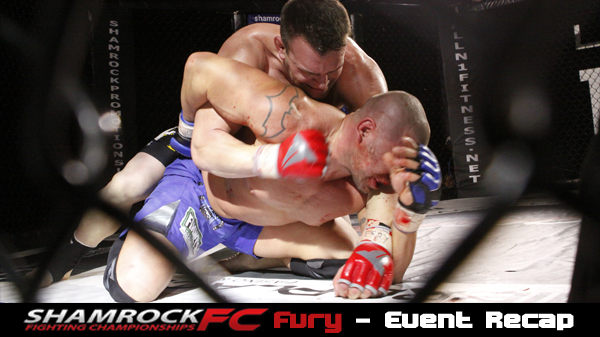 Finney's MMA's Dustin Fischer looked sharp in his first round submission of Cory Hauter. Fischer landed a nice straight left that sent Hauter scrambling. Fischer went in for the finish, securing a guillotine choke at the 2:24 mark in the first round. Krystal Clark's jiu-jitsu was what put her over the top in winning a 29-28 unanimous decision over Nikki Smith. Clark dominated the first and third rounds. In the first she worked both a triangle and an armbar. In the third, she took Clark's back and delivered plenty of punishment. After a rough first round, Damian Newman got things going in the second and third to win a decision over Andrew Berger. Berger had Newman in some rough spots during the first round, including an armbar late, but the tough Southside Fight Club product endured into the second. In the second, Berger transitioned into a guillotine after Newman stuffed his take down attempt. Newman eventually worked to take Berger's back and then maneuvered into position for a triangle submission, Berger fended that off nicely. The third round was all Newman. While Berger was turtled up, Newman landed a big shot coming underneath. He ended the round landing some nice elbows while attempting yet another submission attempt. Tony Van Zandt earned a submission victory via arm triangle over Chris Eveland in the first round. Susie "Mama Beast" Wyatt made quick work of Melissa Shepard. Wyatt, to know surprise of any who have watched her up-and-coming career, won via armbar just 34 seconds into the fight. Montuelle Prater looked impressive in his victory over Kamaal Chilton. Prater displayed impressive and strong striking and pushed the action in garnering a first round TKO. Jeff Rittenhouse won in literally the final second of the first round with a rear naked choke of Tim Masters. Bob Hinchliffe showed plenty of promise and potential in his third-round TKO of Dustin Lampros. Kaleb Nadler got the night started off with a first round rear naked choke of Henry Hofman. Shamrock Fighting Championships returns to the Lumiere on March 23.